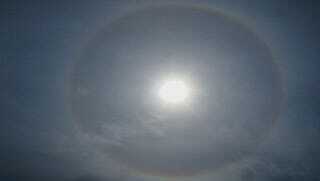 Most of us have seen halos around the sun. We know why they happen. And then there are Bottlinger's Rings. No one has figured out why they exist. It's not unusual, when traveling by plane, to look down and see the sun reflecting off a cloud below you. This little patch of reflected brightness is called a "subsun." Sometimes you'll see a circular halo around the subsun. And sometimes, without knowing it, you'll see an atmospheric mystery. Circular halos are fairly common — they're caused by ice crystals of a specific shape and orientation. But there is an odd phenomenon that sometimes causes these rings to stretch and go elliptical. These oval rings, called Bottlinger's Rings, appear mostly to airline travelers for only a few seconds at a time, and scientists still aren't sure why they appear at all. You can see more pictures of the rings here. The difference from a circular halo is subtle, but unaccountable. As best as anyone can figure, Bottlinger's Rings come from hexagonal crystals with sides that slope at an angle of one to three degrees. The crystals have to be hanging almost flat in the air. One team of scientists estimated that the temperature has to be around -15 °C to make the conditions just right. That being said, even after playing around with the slope and orientation of the crystals, many scientists can't get their models to match up perfectly with the few pictures of Bottlinger's Rings that people have managed to get. So perhaps we have to come up with a whole different theory for the optics of these rings. Any ideas?